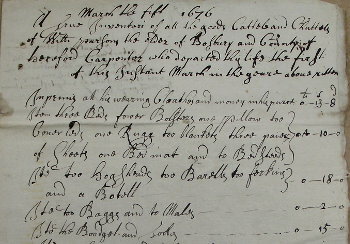 Summary: Transcription of the original will and inventory documents of William Parsons of Bosbury dated 20th August 1673 and 5th March 1676 which are held at the Herefordshire Record Office, reference 54/1/9. In the name of God Amen , I, William Parsons of Bosbury in the county of Hereford, carpenter, being sick of body but of perfect memory thanks be to God for it, do make and ordain this my last will testament, in manner and form following, First I commend my soul into the hands of Almighty God my maker, And my worldly goods as follows. Imprimis I give and bequeath to my two youngest daughters, Elizabeth and Susan, five pounds apiece to be paid to them on their marriage day by their brother William (my son) or else if that be not paid them then my will is that they shall have the house and garden where I now live in Bosbury. I also give and bequeath to them seven pounds apiece more to be paid them at the decease of my wife if she do outlive me. And also all my goods and household stuff whatsoever within doors and without doors I also give and bequeath to them (the said Elizabeth and Susan) after the decease of me and my wife. Item also all my working tools I give and bequeath to my son William, and also the house wherein I now live, paying his sisters the ten pounds before given. All the rest that I have I leave to Perrim my now wife and her I make executrix of this my will and testament, In witness whereof I do hereunto put my hand and seal the twentieth day of August in the five and twentieth year of the reign of King Charles the second, and in the year of our lord God 1673. A true inventory of all the goods, cattles and chattels of William Parsons, the elder, of Bosbury and county of Hereford, Carpenter, who departed this life the first of this instant March in the year above written. Imprimis all his wearing clothes and money in his purse 13s. 8d. Item three beds, four bolsters, one pillow, two coverlets, one rug, two blankets, three pair of sheets, one bed mat and two bedsteads £4 10s. Item two hogsheads, two barrels, two firkins and a bottle 18s. Item two bags and two males [satchels] 2s. Item the boodget [leather water bottle] and tools 15s. Item henpen wood and loose timber 2s. Item 3 coffers, 3 little cupboards, 2 kneading troughs 10s. Item one table and form 1s. 6d. Item one frying pan, one spittle, one broach, one bill and a pick and all other loose old iron and ironware 3s. Item earthen ware and glass bottles 1s. Item all manner of trind [treen?] ware and bowls and dishes and boxes 3s. Item one wheel one chair, stools and other trumpery and shelves 2s. Item 3 bushels of oats and provision in the house 8s. Item hay and an old pigs cot 10s. male form is Perrin and both come from Pierre (Peter).